Jews were first mentioned in Berdichev in 1593. Towards the mid-eighteenth century, the city became one of the main Jewish centers of Ukraine, earning the esteemed title “Jerusalem of Volhynia.” From 1785, Berdichev was home to Rabbi Levi Yitzhak of Berdichev, a prominent Hassidic leader, as well as Rabbi Yitzhak Ber Levinzon, a famous advocate of Jewish Enlightenment. In 1798, a Jewish typography was established in the city, one of the greatest in Russia. In the mid-nineteenth century, Berdichev’s Jewish population rose to 50,000. At that time, a prominent Yiddish and Hebrew writer, Sholem Yankev Abramovitsh (Mendele Mokher Seforim), worked there. During the Russian Civil War (1918-1920), dozens of Jews were killed or wounded in pogroms carried out by the Ukrainian nationalist forces of Hetman Skoropadsky and Petlyura. During the Soviet period, many religious institutions in Berdichev were closed, and Zionist activity prohibited. At the same time, the regime supported Soviet Jewish secular identity and Soviet Yiddish culture. Yiddish became an official language of government bodies. In 1924, the first Ukrainian law-court with proceedings in Yiddish was established in the city, and later the police also worked in Yiddish. In 1928, a Historical-Cultural Reserve (museum) was opened in the former monastery of the Discalced (Barefooted) Carmelites, where a great part of the exposition dealt with Yiddish culture. However, towards the end of the 1930s, all Soviet Yiddish institutions were closed. By the end of the 1920s-1930s, the Jewish population of the city had significantly decreased, due to a mass migration that had begun in the early twentieth century: the 1939 census revealed that only 23,266 Jews remained in Berdichev, comprising 37.5 percent of the total population. On July 7, 1941, the Germans occupied Berdichev. About one third of the city’s Jewish population, including refugees from Poland who had arrived there during first month of World War II, managed to evacuate or escape. The first days of the occupation witnessed wanton murders of Jews by German soldiers. By August 22, 1941, a ghetto had been established in Berdichev, in the Yatki area. From August 1941 to June 1942, the Jewish population of Berdichev was annihilated in a number of murder operations. In a separate operation on April 27, 1942, some seventy Jewish women from mixed families were shot together with their children. During every murder operation, the Germans separated Jewish “specialists” needed for labor. Thus, after the mass murder operation of September 14, 1941, about 400 men remained alive. After the next killing in early November, only 150 of the best craftsmen of Berdichev were spared. They resided at a camp in Lysaya Gora. When in May 1942 they were joined by the craftsmen and youth from Yanushpol, their numbers increased to between 400 and 700 men. Most of them were shot in the summer of 1942. The remaining sixty specialists were incarcerated in the city prison and killed along with the other inmates in November 1943 or early January 1944. 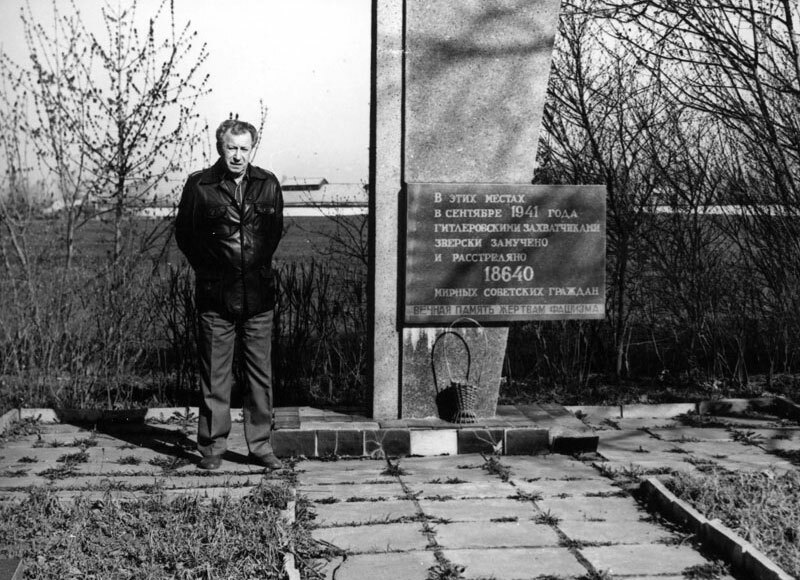 Berdichev was liberated by the Red Army on January 5, 1944. The Gnilopyat River: In the first weeks of the occupation, the Germans forced a group of Jewish women to swim from one bank of the Gnilopyat River to the other, until they drowned. The Historical-Cultural Reserve: In July 1941, some 850 Jews were shot in the course of two days in the area of the Historical-Cultural Reserve. In addition, in late July or the first days of August, approximately 300 Jews were shot by Sonderkommando 4a, later relieved by Einsatzkommando 5. On August 25 or 28, 1941, 546 Jews were shot in the area of the Historical-Cultural Reserve by a special unit of the Higher SS and Police Leader southern front headquarters, headed by Friedrich Jeckeln. 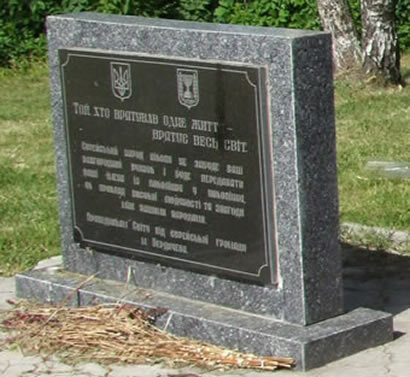 Khazhin: On August 27, 1941 (according to another source, September 4), a special unit of the Higher SS and Police Leader southern front headquarters headed by Friedrich Jeckeln assembled 1,303 (according to another source, 2,000) young, strong Jews, mainly men, on the pretext of sending them to agricultural labor. They were held in the stores of the town’s market (until the required number of men was assembled). On September 4 (according to another source, September 5), the men were brought to the area between the villages of Khazhin and Bystrik, some three to four kilometers south of Berdichev on the road to Vinnitsa, and shot. Shlemarka: On September 15, 1941, the 12,000 remaining Jews were rounded up by a special unit of the Higher SS and Police Leader southern front headquarters headed by Friedrich Jeckeln, Police Reserve Battalion 45, and a commando of the Einsatzgruppe C, with the assistance of Ukrainian police. After 400 “specialists” had been separated, the Germans moved the rest to the military airfield (known as Lysaya Gora), five kilometers from Berdichev on the right side of the Raigorodok Road, between the hamlet of Shlemarka (known as Doichek’s hamlet) and the village of Radyanske. There they were shot in five pits. Sokulino: At the end of October 1941, up to 2,000 Jews – who had managed to hide during the murder operation of September 14 in the rural vicinity around Berdichev – and specialists were concentrated by the Germans in the premises of the Historical-Cultural Reserve (former monastery of the Discalced [Barefooted] Carmelites). On November 3 (according to another source, October 29-30), all of them, except for the 150 best craftsmen, were brought by truck to the area of the Sokulino sovkhoz, to a ditch not far from the forest. With the assistance of local Ukrainian policemen, the Germans ordered them to undress, and then shot them. Krasnaya Gora: On July 16, 1942, all the inmates of the Krasnaya Gora camp, with the exception of sixty specialists, were brought to the shooting range of the former Soviet cavalry regiment and shot. Of the remaining Jews, ten were shot near the camp building. Later, seventy Jewish orphans from the Dimitrov children’s home were baptized and shot the following day at Krasnaya Gora. After the liberation of Berdichev on January 5, 1944, a Soviet Extraordinary State Commission opened the mass graves on the Berdichev-Vinnitsa Road as well as those along the Raigorodok Road. Jews who returned to Berdichev from the Soviet interior recommenced Jewish life in the city. The religious community began to work on the construction of a monument at the main murder site near the airfield. The municipal authorities opposed this initiative, and in 1946 the chairman of the Jewish community Metler was ordered to desist. Instead of a grand monument, the Jews of Berdichev built several symbolic monuments to the Holocaust victims at the Jewish cemetery. 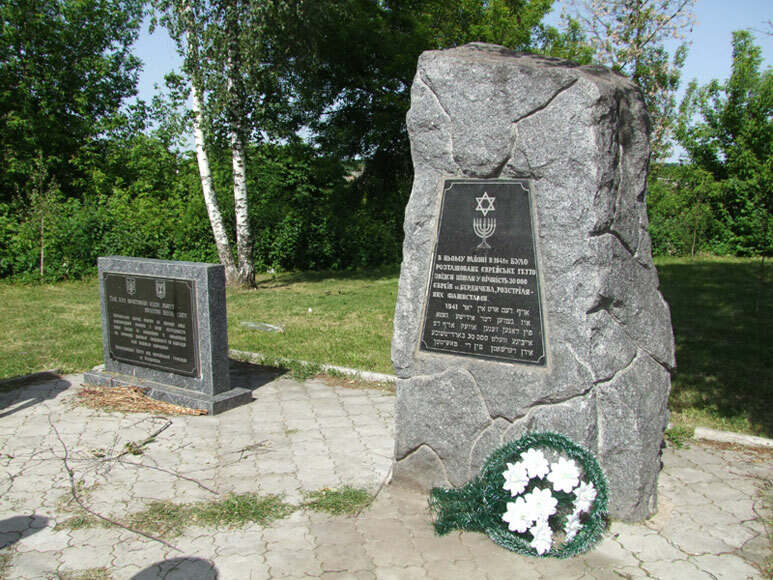 In early 1953, after considerable efforts, the Jewish community was allowed to erect a monument at the Holocaust victims’ burial place in Shlemarka. The monument disappeared a short time later. After Stalin’s death, the community resumed its efforts to establish a monument, and informal fundraising was organized. In 1958, the new monument was ready. 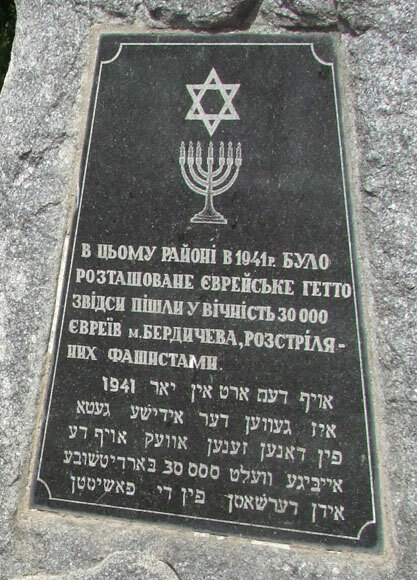 It had both Yiddish and Russian inscriptions; the Russian inscription omitted the fact that the victims were Jewish. The only challenge was obtaining explicit approval for placing the monument close to the military airfield. After long negotiations, the commander of the airbase gave an order allowing the religious community to erect the monument on the airfield. However the party authorities, probably as high as in Kiev, revoked this order. The monument was placed in the Jewish cemetery. In the 1970s, the Jews succeeded, without permission, to penetrate the territory of the airbase to read Kaddish. The guard most probably saw them, but did not act.